Mount Isa Water Board has adopted by-laws for the R48 Reserve, to ensure its continued use as a safe water source and an important recreational area for the community. 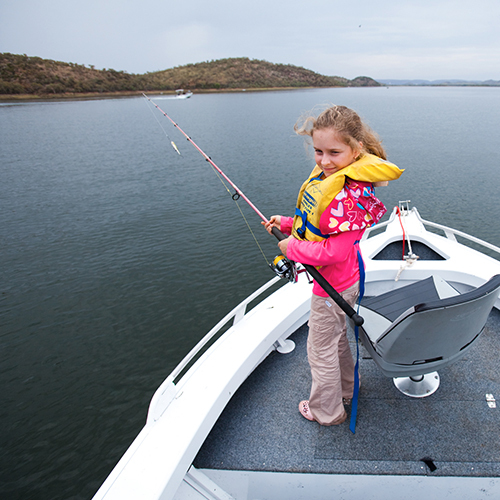 The R48 Reserve, which includes Lake Moondarra, is a popular recreational area enjoyed by the Mount Isa community for water sport, fishing and leisure activities. Mount Isa Water Board (MIWB) acts as trustee for the reserve on behalf of the Department of Natural Resources and Mines, and is responsible for the day-to-day management of recreational activities within the reserve. The long-standing rules for users of the R48 Reserve needed to be legally ratified to ensure MIWB can continue to effectively manage the area in its capacity as trustee for the site. Following a public consultation process MIWB has adopted a standard set of by-laws set out in the Land Regulation 2009 which govern how a reserve can be used. This is to ensure recreational use of the area is effectively and sustainably managed and to ensure the area remains an important sanctuary for wildlife and a safe catchment for drinking water. We recognise that the R48 Reserve is important to the local community, which is why we are carefully considering the most appropriate future arrangements for recreational camping. While the R48 Reserve is a much-loved recreational spot for the community, MIWB must also ensure the safety or quality of this important water source and its surrounding environment is not compromised which is why camping is generally not permitted on the Reserve. Maintaining a safe, high quality water source is MIWB’s top priority. Providing a great space for recreational activities at the same time is a balancing act, which we’re committed to getting right. Future management of camping or other recreational activities on the reserve, will need to be viewed with these broader environmental considerations in mind. We are locals too – we understand how much everyone enjoys this special space. It’s about ensuring the public can undertake one of their favourite recreational activities, but in a sustainable and responsible manner. The adopted Model By-laws are accessible here. In Queensland, reserves are generally governed by a set of model by-laws which are set out under the Land Regulation 2009. By-laws help to ensure these environments are protected and managed in an effective and sustainable manner. What do the by-laws for the R48 Reserve relate to? As the trustee for the Reserve, MIWB needs to be able to continue to effectively and sustainably manage the area and ensure its continued use as a safe water source and recreational area for the Mount Isa community. Has there been a change the rules in respect to camping on the Reserve? No. A this stage camping on the Reserve continues to be prohibited unless MIWB has expressly granted permission (as we do during the Moondarra Fishing Classic). Notwithstanding this, MIWB understands that the R48 Reserve is important to the local community and that there may be community support for reviewing how permits are issued and the conditions under which camping could be made more generally permissible. MIWB is considering if it needs to put in place more appropriate administrative mechanisms related to camping permit provision and management. What was the process for adopting the by-laws? 7. Public notification that the by-laws have been adopted (Government Gazette). How long will the adopted by-laws be in effect? Typically, by-laws are in place for perpetuity or until such time that the government-of-the-day seeks to review or change the Model By-Laws under the Land Regulation 2009.